Free Tommy Robinson, June 9, 2018. Huge London Demonstration. Watch and feel. Geert Wilders, Anne Marie Waters, Gerard Batten. And update on TOMMY interview. VIRAL!! Today, I want to tell you about the huge Free Tommy demonstration in London that's just happened, and the amazing viral spread of my interview with Tommy. June 9, 2018 - 8:30 am (1:30 pm in the UK). I know that people are gathering in London for a planned huge demonstration, Free Tommy. No coverage yet, of course. I know I will be watching the live stream. Almost everyone I know in Great Britain will be at the demonstration, except for one couple around 80 for whom it would be too difficult, and someone else near 80. By 2:30 pm, people are to have gathered in Trafalgar Square for a walk to Whitehall, the site of the British government. At 3:00 pm, there will be speeches. Geert Wilders (Party for Freedom, the Netherlands), Anne Marie Waters (For Britain Party, UK), Gerald Batten (UKIP, UK), and more. I've heard that Antifa has announced they will be there. Antifa - the AntiFact group that uses fascist anti-speech techniques and falsely claims to be against what they are for, fascism. I wonder: if it's needed, will the police, for once, do what they're supposed to do: stop the disruptions, stop violence? Also, do the organizers have protection set up for vulnerable people? It feels good to be part of the event, even in this distant way. The crowd is estimated to be 20,000. Someone shouted 30,000. And around the world there are demonstrations outside British embassies to Free Tommy. The petition to Free Tommy has reached over 600,000 signatures. noon (5 pm in the UK). It's over. No clashes, or anyway none broadcast in the livestream. Why have I been watching? It's not for new information. It's to be there, in spirit, and to feel the pro-freedom and pro-truth spirit, the sense of warmth and caring and connection. V is for VOTE, not for violence. There needs to be a clear strong opening message. It wasn't broadcast this time. It needs to be there at any future event. I'm glad the livestream showed the speakers and their strong message calling for political change. 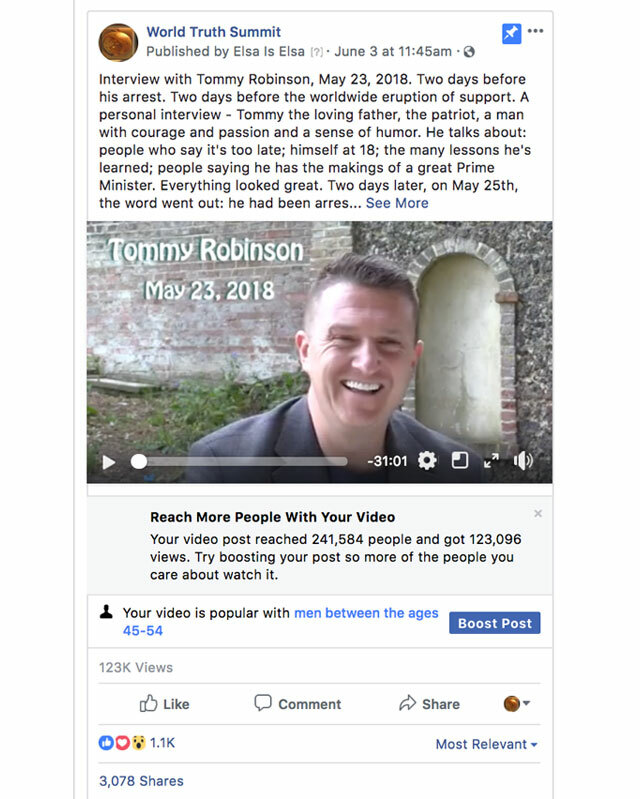 As for my interview with Tommy, done just 2 days before Tommy's arrest, and put online on June 3, it's gone viral. In just 6 days, via multiple channels, it's had over 400,000 views, and over 600,000 posting views. On my Facebook page, World Truth Summit, it's had 248,389 posting views, 124,968 video views, and 3,078 shares. On Tommy's facebook page, it's had over 252,000 video views. And on Youtube, it's had 6,760 view on my channel (Creativity Emporium) and 50,154 on a major channel that reposted the video. There have been masses of raves, as the best video ever of Tommy. It's Tommy the person - loving father, committed freedom lover, learning, growing. It felt wonderful to be able to reach so many people, to help in this way. PS. Something I notice: how I live in an alternate universe, very very different from the one in so many children's stories. More next time.